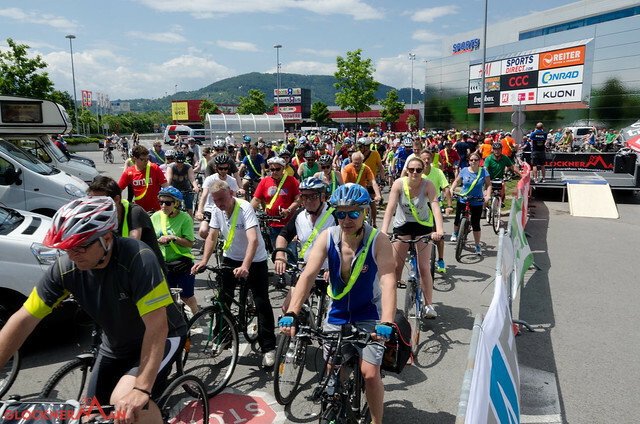 The Grazer CityRadeln is a cycling event for hobby cyclist that takes places several times a year and is organized by the municipal Graz. At the event the car-free streets belong to the cyclists, who ride a route of around 20 kilometres in a comfortable pace through the town on from police cordoned-off streets. Over 500 cyclists usually take part every time. There is always one stop at a refreshment station, called "Labestation". The cooperation of the Glocknerman with CityRadeln makes the start of the Glocknerman to a great experience. The athletes ride together with hundreds of enthusiastic cyclists through the town. For their safety the glocknerman athletes ride in the front of group. At the refreshment station the Glocknerman official starts and the athletes start their adventure. The hobby cyclists ride back to the starting point. The participation is for all Glocknerman athletes mandatory. The ridden kilometres count to the overall kilometres.